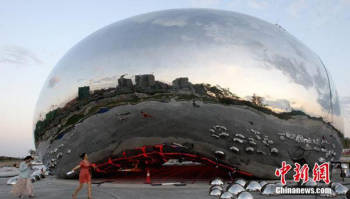 Did a Chinese City Steal the Bean? One of the most intriguing and visually commanding pieces of public art in Chicago is a 2006 sculpture by Anish Kapoor entitled 'Cloud Gate'. 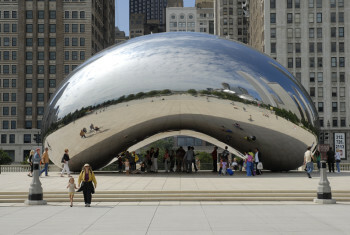 It features a huge ovoid, typically referred to as 'the bean' by locals, which has been constructed out of mirror-quality chrome in order to reflect the clouds and sky above the Windy City. It's one of their most well-known pieces of public art, which makes it all the more galling to Kapoor that it appears a Chinese city has created a public art sculpture that is essentially exactly the same as his. (On the right, top: the original Cloud Gate, and below it, the Chinese knock-off). The city of Karamay, in northern China, has begun to construct a virtually identical ripoff of Cloud Gate, and remarkably unapologetically. Speaking to the Wall Street Journal's China Real Time blog, Ma Jun, the head of the Karamay Tourism Bureau, said, “The idea of the oil bubble comes from the Black Oil Mountain, which is a natural oil well in Karamay. You can’t say we’re not allowed to build a round sculpture because there already is a round one.” Interestingly enough, Ma refused to name the artist who created their version of the bean, which as of yet appears to have no title. Kapoor said in a statement, "It seems that in China today it is permissible to steal the creativity of others. I feel I must take this to the highest level and pursue those responsible in the courts. I hope that the Mayor of Chicago will join me in this action. The Chinese authorities must act to stop this kind of infringement and allow the full enforcement of copyright." Curiously enough, the Mayor of Chicago, Rahm Emanuel, is a typically acerbic - even aggressive - public figure, and yet all he had to say on the subject was, "Imitation is the greatest form of flattery, is what I would say. And if you want to see original artwork like this or like the Bean, you come to Chicago." While that may seem rather blase on the surface, he sort of has a point - it's not too likely that many tourists are going to change their travel plans to China instead of Chicago just because of this plagiarism. But then on the other hand, any artist who has ever had their work misused can immediately attest to how incredibly infuriating it is to see someone else profiting off of your creativity and hard work.